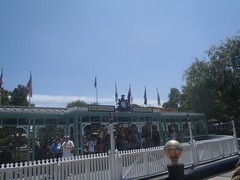 With all the times we have visited Disneyland, neither Mik nor I could ever remember going on the Mark Twain Riverboat. I probably did when I was little, but I really doubt we ever took Mik on it before. Thus on this trip, Mik and I decided to finally go on it. Of course, we were almost thwarted because when we went over to it first thing in the morning it was temporarily down. Luckily, it was back up and going within a few hours and we did end up getting to try it out. They had the wheelchairs load onto the boat first. Note the boat is not level with the dock and they have you load on backwards. When we got off they did not seem to care when we unloaded just that you also go backwards going off. Definitely not a ride to go on when the tippers are on, as they certainly would have been in the way. but we usually leave them off when Mik is not wheeling himself anyways. 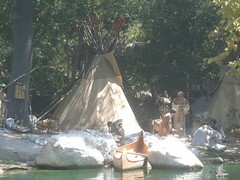 The ride around the Rivers of America on the Mark Twain is not all that exciting, but it is a relaxing break from walking around the park and gives a different look at the areas around the River including some parts you can only see from the boat rides (canoes, Columbia, Mark Twain). 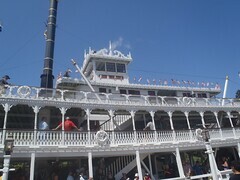 Overall the Mark Twain Riverboat is not a bad ride, but you really cannot explore the boat and are stuck on the bottom level with the wheelchair. One time around every once and a while might be worthwhile, but it would be much cooler if they worked out a way to get wheelchairs up on the Columbia. Going around the Rivers of America on a pirate ship seems so much cooler! !